The City of Santa Cruz sits on the fringes of California’s Silicon Valley, and is sometimes left out of the Valley’s regional affiliation. But in December 2016, the Silicon Valley Leadership Group acknowledged the City’s role as a valuable regional member and green business innovator for the Santa Cruz GreenWharf Initiative. The Silicon Valley Leadership Group’s Turning Red Tape Into Red Carpet Awards recognize outstanding work in the region that promotes local economic competitiveness and business development. The City of Santa Cruz is among nine Bay Area public agencies selected to receive the prestigious award. Santa Cruz’s GreenWharf Initiative was awarded the Sustainable Green Development award for the Small City category, recognizing GreenWharf’s positive relationship between economic development and environmental sustainability. As a suite of collaboratively implemented, interrelated projects, GreenWharf brings together innovative renewable energy — including the first offshore wind turbine permitted on the West Coast — with opportunities for undergraduate internships, graduate research and a Green Business Challenge. Together, these linked projects minimize the footprint of Wharf operations on the surrounding environment while enhancing its appeal as a visitor destination. 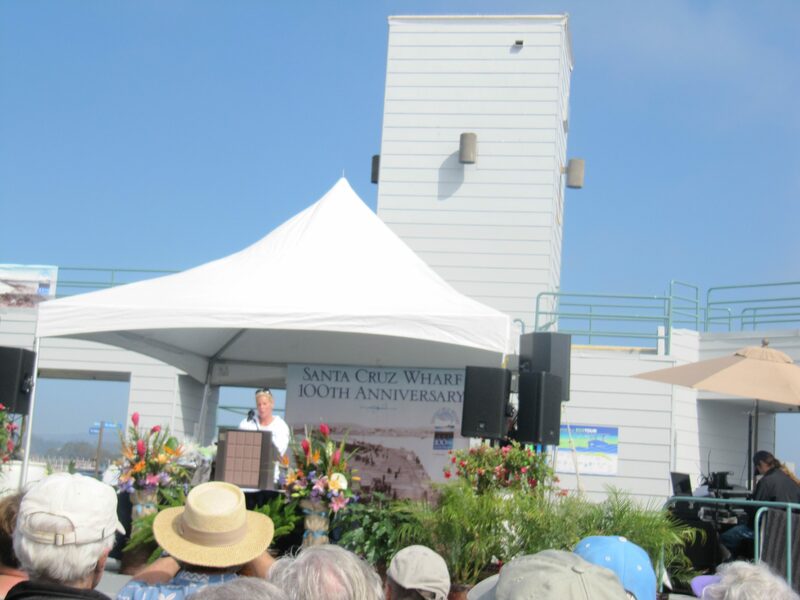 In 2011, GreenWharf started as a partnership between the City of Santa Cruz and the University of California, Santa Cruz, to foster the development and incorporation of innovative technology into the structure and operations at the Santa Cruz Wharf. “The primary goal of the GreenWharf initiative is to develop a model for other coastal communities to incorporate sustainability innovation while creating research, education, and economic opportunities, and to increase public awareness on climate change and coastal resilience,” explained Tiffany Wise-West, Sustainability and Climate Action Coordinator and manager of the GreenWharf Initiative. The GreenWharf Initiative also supports the City’s and UC Santa Cruz’s Monterey Bay Climate Action Compact pledge to reduce municipal greenhouse gas emissions 30% by 2020 from a 1990 baseline. Funding has come from a variety of sources, including the National Science Foundation, which supported graduate students to conduct research, and the Center for Information Technology Research in the Interest of Society , which funded the wind turbine. UC Santa Cruz’s Carbon Fund supported a full lighting upgrade to LED and EV charging stations as well as an ecotourism component launched in collaboration with several area nonprofits. 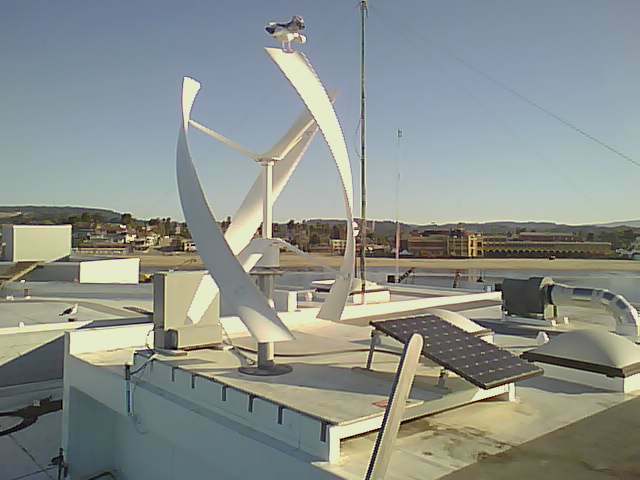 With the GreenWharf Initiavite, the City of Santa Cruz set out to be a renewable energy testbed for coastal solar photovoltaic and the West Coast’s first offshore wind turbine permitted by the California Coastal Commission — to study how these technologies perform under harsh Pacific marine conditions. Soon after the wind turbine was erected, the City experienced an issue with the turbine, whereby the rotation of the blades stressed the wood-framed roof structure supporting the column. Wise-West explained that the structure “was experiencing torque on the roof and required us to do a couple things to minimize the impact: We used dampening material between the support column and generator itself, and this proved to be effective. We also employed an auto-braking mechanism that allows our team limit how fast the turbine can rotate.” These solutions have kept the turbine running smoothly since. A 200-watt solar panel was installed at the same time as the wind turbine and reports to the same energy dashboard. The solar panel and wind turbine operate on the Wharf headquarters building and are are used to charge and maintain Santa Cruz Wharf’s fleet of electric vehicles and power tools. In 2016, the Initiative added a solar streetlamp to the renewable energy testbed, which charges batteries and is independent of the electricity grid. The City and researchers are also looking at the PV system efficiency and degradation due to harsh marine conditions over time. For example, the solar streetlamp was down for several months last year because the batteries were corroding, and this spurred the manufacturer to redesign their battery system.Bird fouling was another issue that Wharf staff was able to address with this innovative solar lamp. The solar lamp generates electricity throughout the day and illuminates the very end of the wharf using a south-facing, bifacial, vertical solar fin. 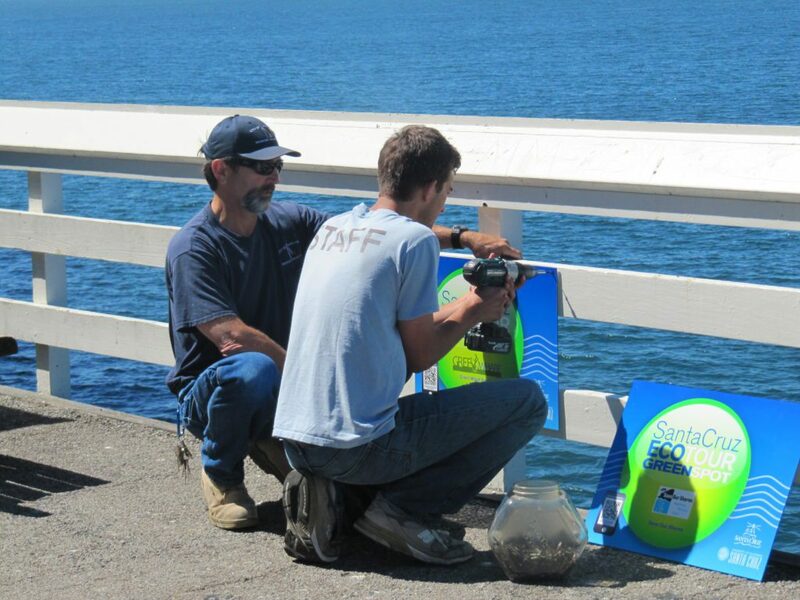 In addition to testing marine impacts on renewable technologies, the City was conditioned by its Coastal Commission permit to complete long-term monitoring, a plan requirement that was lifted once three years of monitoring demonstrated the turbine caused no significant impact on wildlife. “The Santa Cruz proposal [to the Coastal Commission] for a wind turbine was pitched as a temporary installation. The site is already a commercial environment with an amusement park, steel structures, etc. We have since moved to a two-year permit renewal cycle with no plans to take it down,” Wise-West said. The Wharf Headquarters \ site has hosted a stream of community college, undergraduate and graduate students since launching the renewable energy testbed project.Prior to installing the technology components of the GreenWharf, students analyzed a potential LED retrofit to the Wharf street lamps. They looked at the energy demand and also wrote the grant to fund the installation, finding that the upgrade would save the City about $5,000 per year in electricity costs. “Almost all of these projects were either initiated by or had heavy involvement by students,” Wise-West said. “We are able to provide experiential opportunities to students on these projects, and we are very proud of that.” Wise-West herself was brought onto the project during her time as a graduate student doing doctoral work on small wind energy permitting and wildlife monitoring. In fact, the City’s final report to the Coastal Commission was a chapter of Wise-West’s dissertation on bird impacts resulting from the turbine. The study determined that impact to birds is insignificant, as the birds habituate and participate in avoidance behavior — even nesting within 10 feet of the turbine in three successive seasons. Although the City of Santa Cruz owns and operates the Wharf, long-term leases are granted to private businesses. In 2014, the Wharf Outreach Network, a coalition of local nonprofits and research groups, held a big event to showcase all the exciting work going on at the Wharf, including organizations leading ecotours and bird-watching tours — but also efforts undertaken by local business. With the aim to engage more directly with business tenants on sustainability, the Wharf Outreach Network and the City’s Green Business Coordinator met with property owners at a Wharf Tenants Meeting to pitch the idea of hosting a Green Business Challenge (GBC). The Challenge — a program with ICLEI USA roots — offers a customizable national model that local governments can use to engage local businesses and commercial property managers in a fun and friendly competition to save money, energy, water, and waste. Following the tenants meeting, Wharf businesses hopped on board. The City of Santa Cruz has successfully implemented several Green Business Challenges and certifies qualifying businesses as Green Businesses following the implementation of various sustainability measures and a formal review process. For the Wharf GBC, the City offered incentives, such as one-on-one technical assistance, energy efficiency rebates and issuing a branded shopping bag. The GBC team generated a case study to show what kind of cost a typical business could expect for energy efficiency retrofits and the calculated savings over time (with an ROI averaging 1-2 years). Following the student audits, the City GBC team performed more detailed audits and gave ongoing support to businesses throughout the Challenge. Ultimately, seven of the 21 participating businesses were Green Business Certified. “Our Green Businesses received awards at a public ceremony, were advertised in local newspapers, and received explicit placement on the GreenWharf ecotour app,” Wise-West explained of the winners. The City of Santa Cruz promotes this suite of ongoing sustainability initiatives in under one umbrella, known as an Eco District. Wise-West has received calls from Monterey Wharf, where staff is interested in exploring replication of the initiative’s concepts on their shores. Wise-West says the next step in Santa Cruz is to put together a best practices document publication for other municipalities to reference for their own projects. The document will address how to streamline the permitting process for renewable generation or infrastructure upgrades, offer case studies on what worked and what didn’t, and lay out how the City incorporates students to offer experiential opportunities. As a lead city on sustainability, Santa Cruz is demonstrating the power of bringing together planning staff, local business owners, and student researchers united around renewable generation and coastal resilience — cutting through red tape in the process. Visit the GreenWharf website for more information. To learn how you can launch a similar program in your city, contact Tiffany Wise-West, Sustainability and Climate Action Coordinator for the City of Santa Cruz, at (831) 420-5433 or twise-west@cityofsantacruz.com. To launch a Green Business Challenge, visit ICLEI USA’s GBC page or contact Riana Ackley, ICLEI Senior Program Officer, at Riana.Ackley@ICLEI.org. Kale Roberts is Program Officer at ICLEI USA. He supports local governments with their greenhouse gas inventories, climate action plans, and other sustainability initiatives as well as highlighting ICLEI member success stories on the communications team. This entry was posted in CityTalk USA and tagged California, coastal resilience, energy efficiency, energy storage, LED lighting, renewable energy, resiliency, Santa Cruz, solar power, technology, wind power. Bookmark the permalink.